In the ongoing search for new sources of revenue, magazine publishers have always been enthusiastic about the prospect of charging readers small sums of money to read individual articles. Yet until fairly recently, monetising content in this way has been thwarted by the lack of a simple-to-implement, user-friendly solution and a fear that consumers simply won’t pay. There are signs though that micropayment systems are starting to gain traction across the globe. The Dutch owned Blendle platform, which lets readers access posts for a fee via its content aggregator, expanded to the US last year. In Germany, the B2B social network Xing has been aggressive in offering paid for articles on a 70/30 revenue split in favour of the publisher. 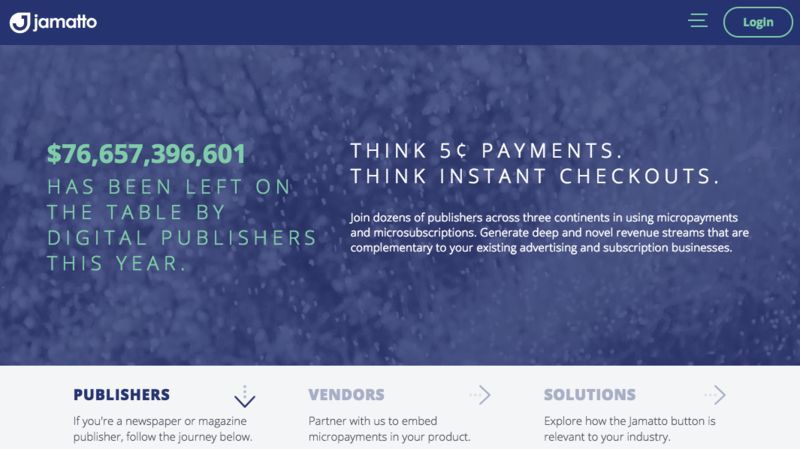 In the UK and other European countries, several companies are now offering innovative micropayment solutions to publishers. Among them is Agate which this week announced that its platform has proved a hit with the publisher Popbitch with over 3000 readers signing up to its service which based around a digital wallet. 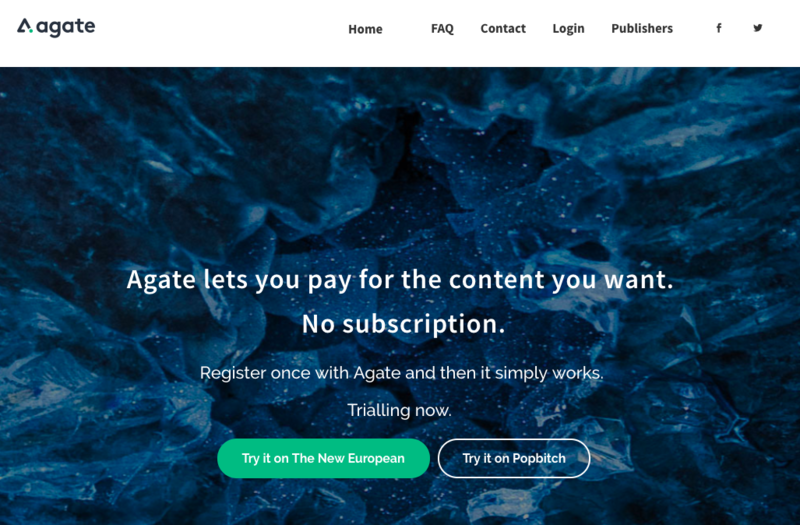 It has a deal with the Archant owned New European too, and founder Dominic Young said recently that it has “a pretty big pipeline” of people looking to launch the Agate system on their websites over the next few months. It does feel as if we have reached a tipping point with micropayments, for both technological and cultural reasons. The rise of fintech companies and alternative banking systems, has made digital wallets, which are central to micropayments, a concept that is a little less foreign at least to younger readers. The systems for charging have been simplified. With Agate, for example, the signup process is seamless and users get the option of either paying for each article purchased or an automatic charge as they read. Consumers can also limit the amount they spend on content each week. Jamatto’s system is also built around a digital wallet that users can top up when they need to. Readers can keep tabs on how much they have spent via the buyer dashboard. Culturally too readers seem more comfortable with the idea of paying for content. Newspapers like The Guardian and The New York Times saw significant rises in subscriptions and memberships last year. Paying for premium content clearly isn’t the anathema that it once was. As Dominic Young of Agate explains “a recent study by Enders Analysis showed how people are becoming increasingly habituated to spending money for online content. There are a number of factors incentivising people to replicate that habit with their news sources. Inevitably if publishers and platforms can prove that readers will at least consider paying for content, it begs the question, shouldn’t there be an aggregator that enables them to access articles in a straightforward way. Will a Netflix/Spotify for content emerge? Dominic Young, who worked for News Corporation on Project Alesia, its fascinating, well-funded but ultimately sidelined aggregator project believes “there are multiple challenges with making that sort of model work. It’s expensive to get going and keeping the interests of the publishers aligned with the platform is pretty difficult.” he adds. Interestingly too Dominic Young of Agate believes that an aggregator style model simply isn’t in the interests of publishers and is limiting their potential to monetise their content. “A “super subscription” – pay one small monthly fee for unlimited consumption of a wide range of content – is attractive to consumers, for sure. When “payment” is thought of as synonymous with “subscription”, it’s a good model for driving a much higher sign-up rate than any publisher can on its own. But it also limits the value of any consumer to whatever their subscription price is. It’s hard to get them to spend more money by offering more or better products – and dividing the fixed amount of revenue fairly between publishers and the platform is a contentious issue too. For Dominic Young’s vision to become reality much depends on publishers being confident that they can entice consumers to pay for content. The jury is out for the time being, but with Agate, Jamatto, Blendle and others like Medium gaining significant traction and growing both the number of publishers involved and consumers who part with cash, there are plenty of positive signs.